Watford remain just one point behind leaders Bournemouth after comfortably beating struggling Millwall. The Hornets took the lead when Matej Vydra volleyed Ikechi Anya's pullback into the corner from 20 yards. Midfielder Adlene Guedioura made it 2-0 from close range after a slick combination from Troy Deeney and Anya. Millwall had chances but goalkeeper Heurelho Gomes was rarely troubled as Watford maintained a strong challenge for the automatic promotion places. The Hornets were unbeaten in their last six Championship away games and nearly went ahead in the first minute after some lax defending from Millwall. 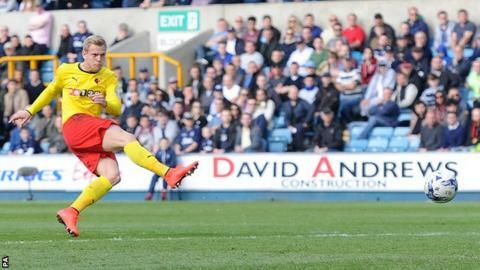 Daniel Tozser's long ball sent top scorer Deeney through on goal, but goalkeeper David Forde was quickly out to block his shot. Midway through the first period Watford found some quality with Anya getting free down the left-hand side to deliver the pass which Vydra expertly volleyed past Forde from the edge of the area. Millwall grew into the half but a scuffed Jimmy Abdou shot from a short free-kick was the nearest they came to finding an equaliser. After the break Shaun Williams hit a 30-yard free-kick narrowly wide for the hosts before Watford took complete control with a second goal. Once again Anya found space on the left-hand side and his pass was met by Guedioura from close range, leaving Forde no chance. The hosts' Aiden O'Brien and Stefan Maierhofer were both denied by Gomes while Odion Ighalo, Deeney and Almen Abdi were thwarted by Forde in the closing stages to keep it at 2-0. The result leaves Neil Harris's side seven points from safety with five games remaining, while Watford stay third, just one point behind league leaders Bournemouth and level on points with second-placed Norwich. "I try to find ways to win the game, goal difference is not under my control. I don't have plans to win 6-0. "We didn't have the game under control - I believe we should have had the game under control for more minutes. "We had some problems during the game, but I can understand this, because it was a very important game and for Millwall too it was an important game." "It's as clear a penalty as you will see. Ed Upson was between the ball and the player. When you're near the bottom you don't always get decisions like that. It might have helped us if we'd have scored first, but that isn't what cost us the game. "We're into the stage where we need to win some games quickly. We've come this far and been saying 'let's keep improving', but now we've got to win games. "The difference, which was clear to see, was the quality in the final third and that's why a lot of the Watford players will be gracing the Premier League next season with or without the club." Match ends, Millwall 0, Watford 2. Second Half ends, Millwall 0, Watford 2. Substitution, Watford. Marco Motta replaces Juan Carlos Paredes. Attempt missed. Daniel Tözsér (Watford) left footed shot from a difficult angle and long range on the left misses to the left following a corner. Corner, Watford. Conceded by Mark Beevers. Attempt missed. Almen Abdi (Watford) right footed shot from the right side of the box misses to the left. Assisted by Adlène Guédioura with a through ball. Attempt saved. Troy Deeney (Watford) right footed shot from the centre of the box is saved in the top centre of the goal. Assisted by Almen Abdi. Attempt saved. Odion Ighalo (Watford) left footed shot from the centre of the box is saved in the centre of the goal. Assisted by Adlène Guédioura with a through ball. Substitution, Watford. Odion Ighalo replaces Matej Vydra. Attempt saved. Magaye Gueye (Millwall) left footed shot from the left side of the box is saved in the bottom left corner. Assisted by Stefan Maierhofer with a headed pass. Attempt blocked. Aiden O'Brien (Millwall) right footed shot from the right side of the box is blocked. Assisted by Stefan Maierhofer. Attempt missed. Magaye Gueye (Millwall) left footed shot from the left side of the box is just a bit too high. Assisted by Lee Martin with a cross. Sid Nelson (Millwall) is shown the yellow card for a bad foul. Substitution, Millwall. Stefan Maierhofer replaces Dan Harding. Substitution, Millwall. Lee Martin replaces Nadjim Abdou. Attempt saved. Aiden O'Brien (Millwall) right footed shot from a difficult angle on the right is saved in the bottom right corner. Assisted by Lee Gregory with a headed pass. Corner, Millwall. Conceded by Matthew Connolly. Substitution, Watford. Almen Abdi replaces Ikechi Anya. Substitution, Millwall. Magaye Gueye replaces Martyn Woolford. Corner, Millwall. Conceded by Ben Watson. Goal! Millwall 0, Watford 2. Adlène Guédioura (Watford) right footed shot from the centre of the box to the centre of the goal. Assisted by Ikechi Anya. Corner, Millwall. Conceded by Juan Carlos Paredes. Dan Harding (Millwall) is shown the yellow card for a bad foul.